First, I’d like to thank Books the Thing for inviting me here today, and for suggesting I write about the impetus for one of the scenes in my book, Counterfeit Conspiracies. 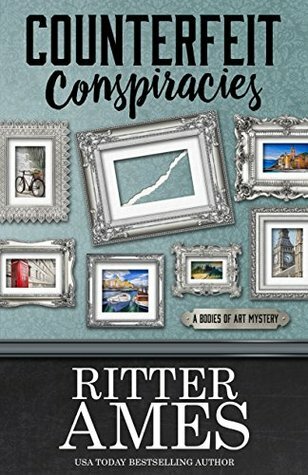 The Bodies of Art Mysteries are my favorite to write, and reviewers have called these books “a high-octane thrill ride” and “a mix between White Collar and Leverage.” So, when I thought back to how certain scenes in the book evolved, I thought I’d talk today about one favorite involving London streets crowded with iconic double-decker buses, various-sized lorries (yep, we’d say trucks in the U.S., but lorry sounds much more Brit), and my characters escaping via a legendary black cab. Until bullets shatter the windows. To clarify, I’ve never had windows shot out of my cabs, but some crazy vehicle-related adventures have happened to me while visiting Jolly Old London-town. One event happened when we traveled there in spring 2008. My husband and I headed for Churchill’s Bunker one afternoon. Hours later, hubby happy and my brain filled with more WWII info than I’d ever hoped to acquire, we decided to forgo heading underground again and grabbed a bus whose number said it circled our route. I jumped on, used my Oyster card, and headed deeper inside, believing hubby followed. Wrong! He’d forgotten to reload his card that morning. An embarrassingly loud buzzer reminded of the mistake. Our indignant driver shouted at my flustered hubby. As the ticket fell into my hand, the bus pulled away from the curb. We shadowed it down the block and I swear the bus driver laughed the whole way. We caught the next bus. It was rush hour—we took a deep breath and prepared for a stop-and-go ride. Whilst hubby obsessed about every injustice, I relaxed and watched vehicular near-misses on almost a second-by-second basis. I memorized the looks of different vehicles from above, and marveled at the serpentine effect as they coursed over the roadway. Caught my breath at daredevil antics of cyclists who risked life and limb weaving through lanes to save hours from weekly travels. I gasped as too-large vehicles ducked down too-small alleys for shortcuts in the traffic kerfuffle. We saw a bus with the right number and flat-out ran. We leapt onto the bus—my Oyster card ready; hubby’s ticket in hand. It was the same bus driver who yelled at my husband and then drove off without us. Really! I’m not sure what language they screamed, but body language said Brown Suit was determined to bring the Persian aboard and our driver equally determined he wasn’t. There was pushing and shouting, and—of course—hissing from the cat. Finally, our driver turned off the bus, grabbed the keys and hurled the key-ring into the bushes. He shoved Brown Suit aside and was last seen stomping back toward the city zone. Eventually, we straggled into the flat, evening on the cusp of full dark after grabbing takeaway from the nearby Indian restaurant. That’s how the action street scene in Counterfeit Conspiracies came to be. The scene is more lethal than my true adventure, but after absorbing all the sights and sounds of busy London streets during that crazy ride, writing exciting fiction is easy. OK Now I cannot WAIT to read this book! I love books about art theft, and shows like Leverage. This sounds fantastic. And many thanks to Ritter Ames for sharing your personal experience and how it translated to your story. I love it!